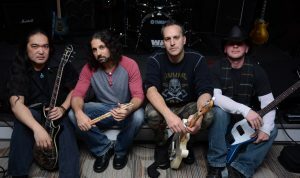 Outlet is a cover band based out of north/central New Jersey, playing bars, clubs, parties, and other events in the tristate area. They have been playing together for a few years now, rocking out every venue they play. 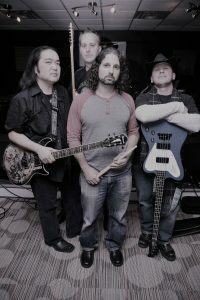 Outlet consists of Marc Goldberg on lead vocals and drums, Kosaku “Ko” Nakamura on lead guitar and background vocals, Marc W. on rhythm guitar and background vocals, and Greg Manderski on bass guitar and background vocals. “We touch upon a little bit of everything in the rock music category, depends on the venue and the crowd really, from Chuck Berry to the Rolling Stones to Pearl Jam to Kings X to the Black Crowes to Weezer, and the Dave Matthews Band,” -Greg. “We have had many requests to play acoustic and unplugged shows, like the whole MTV Unplugged thing, electric but just turned down.” -Ko. Each member of the band has had an exciting involvement both past and present in the music industry. Ko has been playing for over 25+ years. His past projects include original band Broken Soul, cover band Throwback, G-Man Power Duo, and rock theater tribute Theater Rock. Ko has also worked as a recording engineer for a few named acts such as Dream Theatre, Liquid Tension Experiment, and Rudess Morgenstein Project. Greg has been playing bass and guitar for 22+ years. He has played in original and cover bands – No Style, Postmark Twain, More Then I, and other side projects along the way. With More Then I Greg, made some great performances at CBGB’s, The Crossroads, Six Flags, Headliners, The Birch Hill, The Wonderbar, The RWJ Barnabas Healthcare Arena (formerly known as the Ritacco Center, the Poland Spring Arena, and then Pine Belt Arena) opening for The Marshall Tucker Band, The Stone Pony opening for Bret Michaels, Josh Todd of Buck Cherry and The Von Bondies, and Plattsburg University opening for OAR. Marc Goldberg, Outlets’s lead vocalist and drummer also has 25+ years as a singer, drummer, and guitarist. Marc has played in original band More Then I, with Greg, which recorded 2 albums and toured the tri-state area playing over 200 shows over 4+ years at venues such as CBGB’s, the Crossroads, Six Flags, Birch Hill, The Wonderbar, The RWJ Barnabas Healthcare Arena (formerly known as the Ritacco Center, the Poland Spring Arena, and then Pine Belt Arena) opening for The Marshall Tucker Band, The Stone Pony opening for Bret Michaels and The Von Bondies, and Plattsburg University opening for OAR. Over the past few Marc has also collaborated with the NJ-based soul band, Remember Jones, as a drummer in their staged concert of “Hair The Musical” and as a vocalist in their Joe Cocker Tribute show, “Mad Dogs and Englishmen”. Marc also is a regular performer in rock musicals at the historic Count Basie Performing Arts Center, most notably having played the roles of Judas in “Jesus Christ Superstar” and multiple featured roles in “The Who’s Tommy”. Outlet is with Kosaku Nakamura and 2 others. Outlet is with Kosaku Nakamura.